2-11-2017: (Needs Subcategory) | What Really Happened at Standing Rock? Intertribal Summit to Protect Our Water – Press Conference with Winona Laduke, LaDonna Brave Bull Allard, Derick – Manitoba Grand Chief, and Dillon Jennings. In Duluth, Lake Superior. In pushing on with the DAPL, laws have been broken & human rights violated. Treaty rights have been ignored & behaviour towards the water protectors has been violent, destructive & unjustified. America needs to stand by our own laws. Still the strength of the tribes, our leaders & the people, as well as those supporting us, has been inspiring. If there is no clean water to drink, there is no future, no economy, & no future for our children & grandchildren. Fossil fuels are no longer needed, At the moment more than 57% are wasted. Pipelines always leak & have other problems. Renewable energy is already creating more jobs & new businesses & will continue to become the main energy of the future. More jobs are being created by oil companies in cleaning up the spills, leaks & contamination, than in the actual construction & maintenance of pipelines. Indigenous peoples are bringing natural laws into focus, these offer a great hope to all Humanity. Everything in Life needs balance & almost everything needs fresh water to survive. Mauna Kea, Big Island, Hawaii – Hawaiians & others, in ceremony & saying prayers, standing with Standing Rock; sound quality variable due to wind interference. 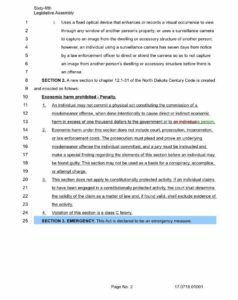 MONDAY, Feb. 13, 10:30am: testify against HB 1193 at the North Dakota State Capitol, in the Fort Lincoln room. 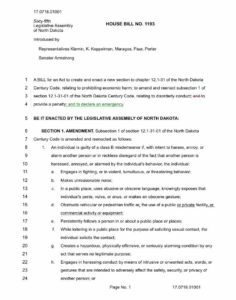 HB 1193 criminalizes public assembly, and makes it a felony if the “intent” is to cause more than $1000 in “direct or indirect harm” to a business. Here in North Dakota, there seems to be an ongoing belief that the U.S. Constitution doesn’t apply.